The church I go to and work at has chosen to encourage everyone who attends, from age 12 on up, to read through the entire New Testament in eight weeks. When I first heard that we were going to do this, I confess I was a bit overwhelmed at the idea. How was I ever going to do that during one of the busiest seasons of my life? It’s a HUGE amount of reading in a very SHORT amount of time, I’m just saying! BUT it is turning into one of the BIGGEST blessings that I have ever experienced!! We all started reading this past Monday. What makes this reading unique (other than the fact that we’re reading it in eight very short weeks) is that the Bible we are reading from has been altered a bit. Before you start gasping for air and wondering what heretical thing we’re doing, let me explain. It is the New International Version but they have taken out the chapter and verse marks and it reads like a story instead of an intellectual book. They have also arranged the books by authors, ie. Luke and Acts are the first books we read since they were written by Luke, and then we move into the writings of Paul which are arranged in chronological order. Nothing has been taken from the Scripture and nothing has been added. However, reading in this new format has caused me to see the Word of God in a new and fresh way. I tell you all of this because I’m guessing that for the next eight weeks you will be reading in this blog the things I’m learning from my perusal of the New Testament Scriptures. 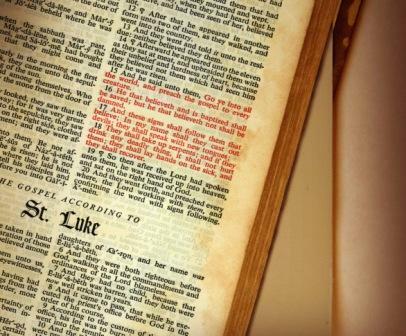 This week we are reading the book of Luke and many of you know that last year I took on a project to copy down the whole book of Luke (I finally finished just a few weeks ago). So I was secretly wondering if I would see anything new. But as God has proved over and over His Word was a two-edged sword piercing my heart again with a very familiar passage. The story takes place in Luke 2.41-49. Jesus is twelve years old and has traveled with his parents to Jerusalem. They are on their way home when Mary and Joseph realize that Jesus isn’t with them. If you’re wondering how this could happen – let me tell you it’s easy when you have numerous kids, bunches of relatives and multiple caravans. It’s easy to think they are with someone else, only to find they’re not. Unfortunately, this is the voice of experience. I’ve always struggled with this passage of Scripture because it sounds like Jesus is scolding his parents. At first glance it seems that he might just possibly be a bit disrespectful. But after reading this again this week, I saw something in there that I’d never noticed before. It says that his parents returned to Jerusalem and then it took them three more days before they found him! I always thought that it took them three days to get back to Jerusalem. They had searched in Jerusalem for three interminable days before it dawned on them to look in the temple. Mary and Joseph had seen the angels, the shepherds and the wise men. They’d experienced the virgin birth of their son but in the ten to twelve years since all of that had happened they had forgotten who their Son really was and they went last to the place they should’ve gone first! No wonder Jesus said what he did. I couldn’t help but wonder as I read this if I have done the same thing? I have a problem . . . What’s the first thing I do? I get on the phone and talk to a friend. I try to fix it on my own and only after that doesn’t work do I finally bring it to the ONE I should have gone to FIRST. Why is prayer always my last resort instead of my first inclination? Could it be that I’ve lost sight of who He is and what He has done in my life in the past? Could it be that I don’t really KNOW who He is? Let me ask you? Is He the LAST place you turn to when you can’t solve things on your own or the FIRST place you run to? So, SO much truth in here. I'm glad you're doing the challenge, Kristi – have a few friends at your church who are doing the same. And I LOVE this insight – I also hadn't picked up on it. VERY cool.